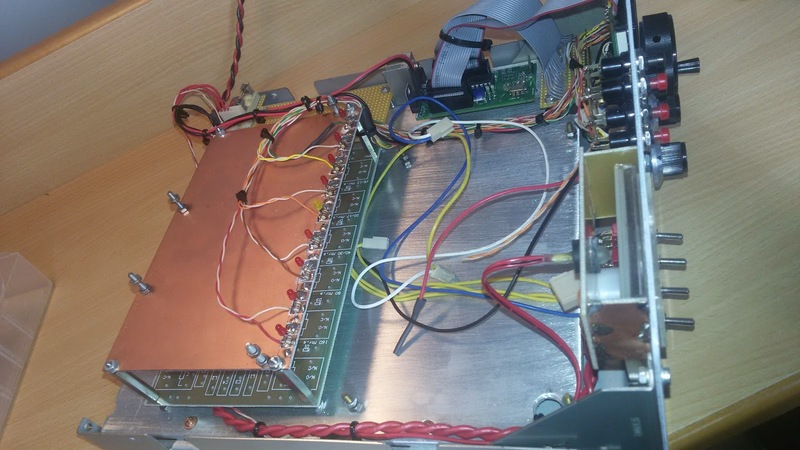 This QSO was made with only 500mWatt QRP.Because I was outside the range of my bandfilter,at the time it was only 100kc wide, a lot of power was stuck in the filter.Later I made my new bandpass filter which I described in the blog.Just like all my HF QSO`s I used the HyEndFed 5-band wire antenna. After a long period of time ,I finally found a few moments to pick up the build of my Multiband MK1 Bitx.As you can see I put all the circuit boards in a housing and made all the necessary connections for the receiving part of the rig,because the low pass filter board and the amplifier are not ready yet. For the housing I took an old Aiwa midi audio set which was broken.Because the front of the Aiwa was curved,I had to change it for a piece of double sided copper PCB.First I had to grind the PCB and after that I sprayed it with a few layers of white paint. For the VFO,I used the PA0KLT VFO which I have mentioned earlier in the blog.I didn`t have tested it,so the power up moment was very exciting.After I hooked up the antenna and gave the rig some juice.......nothing happend.Aha,maybe a loudspeaker will help.After I connected the speaker,I heard some noise coming out of it.When I tuned the dial of the VFO,there where some frequencies where I could hear a whistle,but no stations.Now what.....Silly me....I forgot to give the bandpass filter 12Volts.On the picture you see that I constructed a PCB with led`s under the bandpass filter board.In the front I connected a rotary switch with 12 positions.This switch is used for selecting the right bandfilter.Just to make it a little bit easier for myself,it`s now visible by means of the led`s,which bandfilter is live.Later I will replace the bandfilter switch for a Band Output BCD decoder by means of a HEF4028 IC and some switching transistors (BC547 and BC640).You can see that I already reserved a space in the rig for it.It`s the PCB with alle the little holes. Notice the unpopulated Amplifier and Lowwpass filter PCB.The I/O flatcable from the VFO is connected to another piece of pcb with holes in it.This was easier for me to connect some single wiring to all the push buttons.For the S-meter I took another old Hitachi band recorder VU-meter which I used in my Bitx20 V3 as well.With an old light bulb connected at the back of the VU-meter,it gives you that warm glow when you look at the meter on the front.Connections between the Bandpass filter and the exciter are made with RG174 coax. 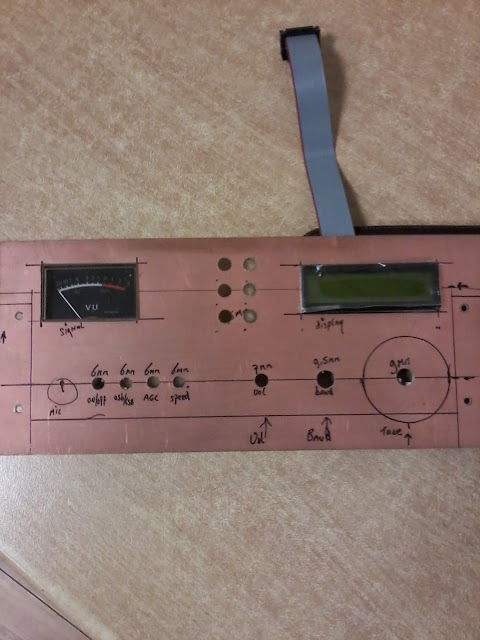 Now that the stations where comming thru,it was time to adjust and configure the exciter and the VFO.Because I use 10.000MHz as IF,I had to enter this value in the VFO as well.I also did a frequency calibration by connecting a frequency counter on the output of the VFO and calibrate the reading on the VFO with the reading on the counter.This is all written in the VFO manual.On the font of my Multiband Bitx,there is also a switch USB/LSB.With this switch you can align the oscillator.Just turn to a strong station on e.g. the 40 meter band,put the switch to the LSB position and adjust the green variable capacitor on the upper left corner on the exciter PCB so that the station is coming thru with a clear audio.Do the same with the switch on the USB position.Find a strong station in e.g. the 20 meter band,and adjust the RED variable capacitor so that also this station has a clear audio.When you adjust the variable capacitor,be aware that you make a shift in frequency.Adjust your frequency with the VFO.If you do this a few times back and forewards,I think that your oscillator is well aligned. For the safety of the components I constructed a little PDU with a fast blown fuse and two Molex connectors on it.There is room for six 12V +/- connections.On the left side of the PDU (Power Distribution Unit) you see the PCB for the future build of the BCD Band and LowPass filter switching board.